What Happens if a Live Wire Comes Loose From an Electrical Outlet? Lighting starts as a mass of negatively charged static electricity in a cloud. Once the cloud can no longer contain that electricity, the potential discharge starts looking for a positively-charged target. Positively charged targets on the ground send "streamers" of energy upward; these streamers act like a bull's-eye for the lightning. 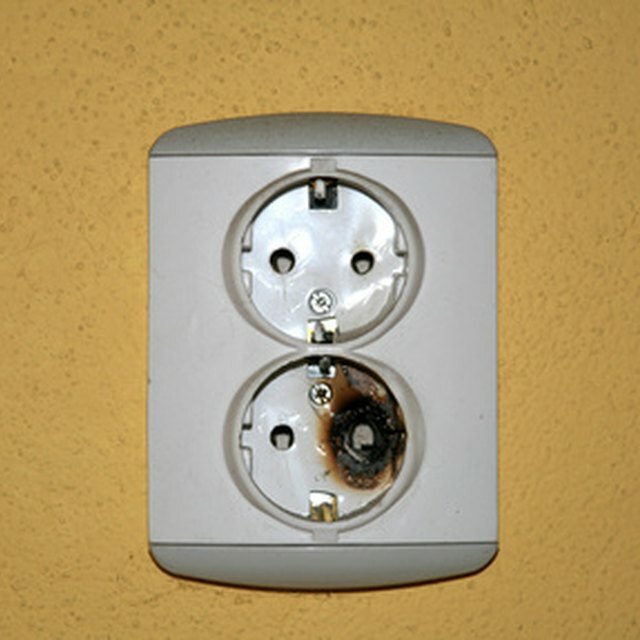 Lightning strikes can easily damage electronic components and wiring and not always by direct contact. Lightning is as dangerous as it is beautiful. Like all electricity, lighting seeks the shortest and least-resistive path to the ground. If one wire isn't capable of carrying the lightning's immense energy, the current will split off into nearby sources and go to ground that way. A lightning bolt that enters the home through a cable wire can easily transmit its energy to nearby electrical, telephone and ethernet wires as well as plumbing and the reinforcing bars in your concrete. If the lightning bolt's energy goes through any one wire of your home, that wire is toast. The insulation may burn away completely (depending upon the insulation thickness and bolt voltage), and the wires inside may melt and fuse. The problem is that wires are made of many small strands. Electricity travels over the surface of these strands, not through them as you might think. Fusing the strands together can create a point of high resistance in the wire, which may later result in failure. Electricity and magnetism are tied hand in hand. A large electrical discharge will produce a magnetic field; when that magnetic field hits a conductor, it turns back into electricity. This electromagnetic pulse (EMP) effect is the reason that atomic bomb explosions can damage electronics far beyond the blast radius. Integrated circuits and solid-state electronics are the most vulnerable to inductive damage, since their microscopic connections can't withstand even a small voltage overload. That aside, the EMP itself is more than capable of erasing magnetic storage devices like certain computer hard drives. Aside from replacing the obviously affected wiring, you would need to hire an electrician to both visually and electronically inspect all of the home's wiring in the event of a lightning strike. The electrician will visually assess all of the accessible wiring and may perform a resistance test on the wiring. A given diameter of wiring creates a certain amount of resistance (ohms) per foot. The electrician can determine whether or not the wire has sustained damage by measuring the ohms of resistance at either end of a wire and dividing by its known length. There are two ways to protect yourself from lightning's most destructive effects on your home and wallet. The first is to install a high-quality lightning rod that extends all the way into the ground (as opposed to those that connect to the ground via a length of wire). This won't protect you from inductive damage, but it'll save your wiring. The second way is to purchase lightning-strike insurance from your home-insurance provider. Lightning insurance doesn't add much to the bill, but it can save you thousands in repairs. Can I Splice an Electrical Wire for a Range?